I walk up early the next day. A miracle did happen, I can see no clouds in the sky. The sun was shining bright. Nadia told me I was very lucky, and shes also sure that lots of people will go up to ski or to hike. So I hurriedly prepared and proceed with my hike. I was glad I decided to take the chairlift, it was a 15 minute scenic ride. Very enchanting (yet scary) view. For the record, I have no experience climbing in alpine/snow. Since there were fresh snow from last night, the whole mountain top was covered in snow. Alpine hike is very very much different from the tropics, everything was white and there is no trail. As the sun goes higher, the surrounding goes brighter, to the point that its very difficult to open your eyes. To those who are still not aware, long exposure to this surrounding can cause snow blindness. 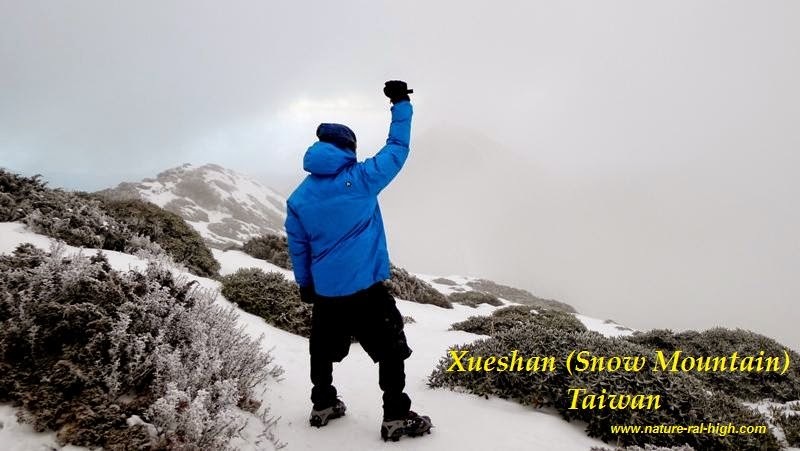 UV light is several times stronger in the mountain,specially in alpine condition. Adding to the problem was that I forgot to bring my sunglasses (which I think is still in-adequate). Miracoleously, a good Samaritan lend me her snow glasses. She said that I just put it back to a rock where we met. Shes really an angel. The terrain is rolling until you reach the summit. Whenever there was a bit of uphill trek, I was breathing heavily. I dont know if its the weight of the snow boots and shoes (around 2-3lbs each leg), or the air was just thin. Footing was also difficult on uneven terrain due to the size of the snow shoes. I got lost twice following two ski tracks, losing much precious time, I guess its just my climbing instinct that saved me. Since time was not on my side, I didn't took my lunch. I just ate the choco trail food I brought. My perception was that when you on snow it will be chilly, but as I quicken my face, I sweat a lot. But whenever I made short stops to catch my breath chill immediately take over. The most difficult part was the final assault to the summit, it was steep. I reached the summit at around 12:15pm. A few minutes early of my turn-back cut-off time. The summit view was unexplainable. Snow cap mountains on the close distance and as it goes farther the view gets greener. I met a Swedish and Australian couple on the summit, I believe I was the 4th to arrive at the summit that day. I really want to stay a bit longer to enjoy the view, but time was moving fast. The Angel and her kid. Climbers going up after me. I really thanked God I was able to do this climb. After a few days, I learned that not all locals climbed (or want to) Kosciouzsko during winter. As of this writing, the skin on face is having its second peeling due to intense sunburn. I told my american friend before I can't imagine climbing without trees, now I know, and its also beautiful. I am really against solo climb, but I have no choice for this one. It was more mentally tiring than physically. Travelling home in the bus I rarely slept because of the mental strain. Even when I got home in the comfort of my bed. I remember Bear Gryllys (of man vs. wild) crying a few hours before his flight above everest using an untested flying craft. Pastour Imata also cried before his final assault to everest summit. I also felt the same uncertainty, specially the day before the climb. I was sometimes shivering, thinking what I got myself into. And also when the time I got lost. But I guess, thats what makes an adventure more rewarding. When you conquered adversities.